Karaoke is the time to bring out the bathroom singer in you into the public arena. The karaoke nights in the citya��s top watering holes can help you shed inhibitions and flaunt your singing prowess to the world. Did you know that karaoke singing releases endorphins, the happy hormones that make us feel good? We speak to two Tollywood stars – actress Regina Casandra and producer Lakshmi Manchu – to find out their top three places to sing along in the city and why they love it. Located in GVK One Mall, HRC in Banjara Hills is where Regina Cassandra prefers to go hoarse singing her favourite tracks with her besties. a�?Whether you drink or not, it always has a pleasant ambience and brings out the crooner in me,a�? says the 27-year-old star. The rock-n-roll pub has focus lights to ensure the singer hogs the limelight. The walls aptly decorated with different props like guitars and leather jackets create the a�?let us rock and rolla�� mood in you. Known for its chilled out crowd, this coffee lounge at Kondapur is where producer Lakshmi Manchu likes to turn into a singer. Ita��s the first place that she and her friends unwind with their own renditions. The ramp here doubles up as a dance floor for the weekend events. The little cottages at the coffee lounge makes it easier for friends to team up and hang out. The lounge has a projector which is used for karaoke nights and ensures the singer gets his 15 seconds of fame on the screen. 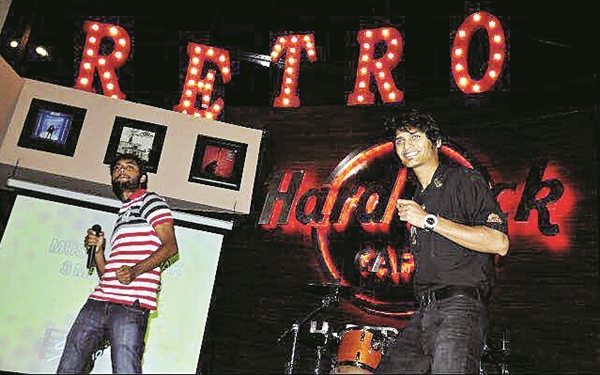 10D in Begumpet is the favourite destination for karaoke nights. a�?It has a typical British ambience and is always fun to sing to this elite crowd,a�? says Lakshmi, the 38-year-old producer. The seating in the pub is also something that adds to the charm of the whole set up making Karaoke nights a fun event.